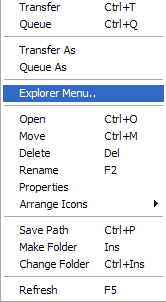 When right-clicking on an internal file (in Windows) I'd love to be able to see some explorer context menu entries OR, as they do in some FTP software, an entry that lets me switch to the explorer context menu. This way I could perform some file actions w/o going Open Thought Folder etc. Dys, have you been able to come up with a way of linking that would do this? 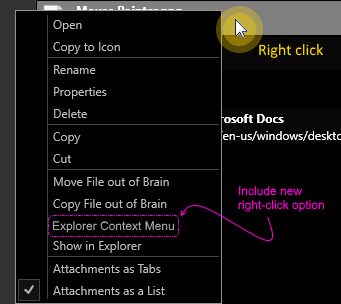 When I right-click on a folder or file in my FTP program, one of the context menu entries is "Explorer Menu..."
Clicking that option brings up the right-click context menu as-if you right-clicked the file/folder from within Windows Explorer. What else do I have there? Add To Archive (from WinRAR), convert to PDF (Adobe), Carbonite (back this file up online or not), etc. etc. Rubbish. Adding it is a UI step; the call is completely Windows API. Well, you mean other then saving a click or two? I can see where people that have some sort of encryption/decryption applied to a document they've got stored inside their brain might want to, oh, say, decrypt the item and then open it. Considering PB doesn't have any encryption/decryption this would be the ONLY way currently to encrypt your "internally" stored data. There are other things. Consider graphics--- I might want to shoot a picture I've got stored internally in PB to email or to a USB thumb drive. That Explorer "Send To..." option would be quite handy then. Or I might want to resize that graphics, to make a smaller version to use as a wallpaper in that very brain running on a laptop, instead of on my HUGE work monitor. So, sure, you aren't doing it everytime, but it does save a few clicks when you ARE going to do it, so it seems like a reasonable request to have it around--- if it doesn't cost us anything noticable as users. I suppose that they could add Open Attachment's Containing Folder to the Attachment icon's context menu too (underneath Open Thought Folder) - not a bad idea, eh? PB team, what do you think of this? 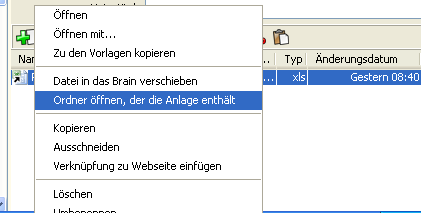 *IFF* the file exists within the local file structure and/or is presently accessible on a local network share, then allowing for the Windows Explorer Context Menu to be invoked directly from within TheBrain is a slick addition to shave off extra time and clicks to invoke deeper functionality that Windows provides for files. This seems to be a fairly common action within modern apps that feature some sort of expressive interaction with the files stored on the local file system ... much like TheBrain does. Thoughts on considering this feature?